Online tickets sales are now closed. Tickets are available at the door. The Itinerate Visitors is an acoustic quintet interpreting the works of Bob Dylan, Grateful Dead, Van Morrison, and many other rock and folk musicians. With an eclectic background in classical, bluegrass and folk, the band also includes original songs in the show. The instrumentation includes guitar, violin, bass, and finger percussion. The band’s name is derived from Helen & Scott Nearing’s Maple Sugar Book. 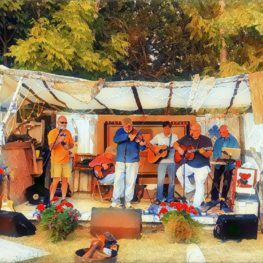 The five musicians (Paul Anderson, guitar; Bruce Cahill, Guitar; Rob Roper, violin; David Lewis; bass and Brian Norris, hand percussion) have played together since the mid-1980s when they discovered their common passion for Dylan, the Dead, and bluegrass. Paul is a regular host of the radio show ‘Bronzewound’ on WERU and has performed in other music acts including the bluegrass bands Blue Northern and Kinsmen Ridgerunners. Bruce lives in Windham Maine and has been playing with various combinations of musicians for over 30 years. Rob for many years played in UMaine’s orchestra and also with Paul in the Kinsmen Ridgerunners. David is a long time performer on guitar, bass, and pedal steel and performed with Blue Northern and The Searsmont Street Band. Brian is a Dylan enthusiast who expresses his musical passion on hand percussion and more!